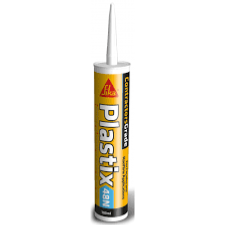 Sika Plastix-48N is a contractors grade, low modulus, neutral curing silicone sealant suitable for many construction applications, but particularly suited for all façade and roofline applications. Ideal for perimeter pointing of window and door frames, sealing plastic roofline areas and general weather-sealing, it has good flexiblity and excellent adhesion to all common window/door/roofline substrates. Available in the 2 most popular colours in façade/roofline applications.